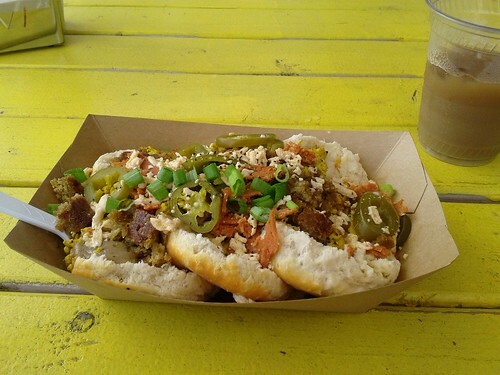 This entry was posted in food cart, restaurants, veganmofo and tagged austin by mollyjade. Bookmark the permalink. Damn that looks good! I think I had the Donna Summer when I was there. I miss Austin! I can’t believe we didn’t make it to Biscuits & Groovy when we were in Austin, it looks great (although I think I’d find the “real” or “vegan” labels a little irritating – it isn’t fake food people!!) and it’s on the list for next time! Wow! That’s a whole lotta yummy goodness on that little paper boat! gonna have to replicate that with my next batch of biscuits! I love the Donna Summer and Gloria Gaynor, but I was also very impressed with the burrito. The owner actually gave me a discount on it because I only (!!!) wanted 6 or 7 things in my burrito. Makes me wonder how much stuff people normally request!